The title of this blog, “Find Meaning in Your Social Media Analytics” is kind of broad and could probably be interpreted in many ways. Upon coming across the blog title, one might think it was about discovering a secret way of distilling all that unruly social media web traffic into coherent and meaningful data reports. Others may think it is a blog about some new age digital strategy that will help you find your inner social media analytics chi that simplifies the way you look at clicks, likes and impressions. Although these ideas sound great and might be topics for future AHA blog posts, this one is simply about how to help you locate and find meaning in the social media analytics tools provided in your Facebook and Twitter accounts. So let’s get started with this simple road map and light overview of the Facebook and Twitter analytics platforms that may help you make more sense of why you are actually posting there in the first place. There is also the option to click an individual post within the post list and have a full view of the post pop up with analytics in tow. Facebook insights is a good data gathering tool to help you figure out what type of messaging, content and photos/images are getting the most attention during your Facebook social media campaigns. Twitter’s social media analytics tool can be found at analytics.twitter.com. You will need to be logged into your Twitter account to use the tool. The Twitter analytics dashboard provides a month over month report on your tweets. 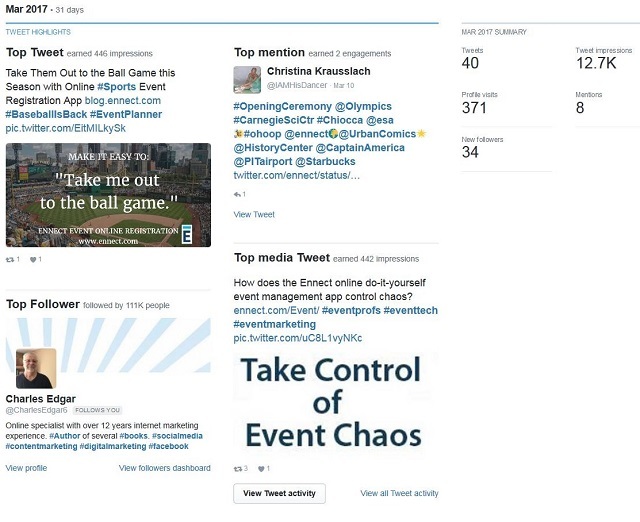 The dashboard provides a top level monthly summary and a click-to-view individual tweet snapshot which drills down further to analyze the messaging. In conclusion, there is a ton of rich information and marketing insight that can be gathered from these two social media analytics tools. You just need to know your way around the dashboards and you will be harvesting analytics like a seasoned data farmer in no time. So, now that you know how to easily find meaning in your Twitter and Facebook social media analytics, go forth, be social and report on it! Need Help With Your Social Media or Inbound Marketing Tactics? Are you are overwhelmed in your marketing role and can’t find time to manage your social media or web traffic analytics? Could you use help with content creation or inbound marketing tactics? Elliance has top industry gurus that can assist with SEO, metrics and many other digital services to help you succeed. Visit Elliance Capabilities to learn more. A Facebook Like is Worth What?!! Are Twitter Hashtags Polluting The Social Media Digital Beach?